The last indoor scale meeting of the year took place at the Swindon Oasis, with a turnout that could really only be described as very poor. There were fun fly slots incorporated into the schedule, but only a handful of people turned up to take advantage. Quite a few of the regular competitors were also absent, but those who did turn up had a very enjoyable (if cold!) day. Due to a crisis on the judging front, both CO2/electric and open rubber classes were judged on flying only, with no marks were awarded for scale. I think that once in a while this is fine, as it gives those models a chance which we regularly see flying superbly on the open classes, but get low scale marks due to their layouts and “lack of complexity”. 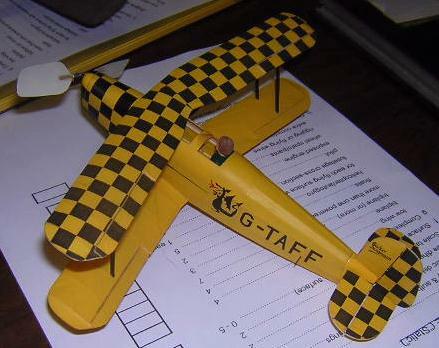 I had brought down my old Cessna Caravan out of the loft to fun-fly it, but when I heard there was no static judging, I entered it in the Rubber event instead. It managed a couple of decent flights before a rather spectacular stall (perhaps due to too many turns being added) resulting in a broken prop. Thereafter I struggled to get it to fly at all! Still, nice to get the old girl out flying again. The Peanut and Pistachio classes were judged as normal (well done Derek Knight for stepping into the breach!). 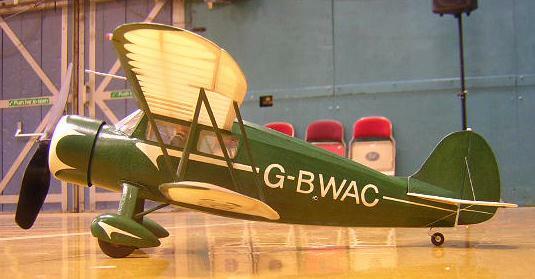 It was good to see some fine new models, including this marvellous new open rubber D.H.87 Hornet Moth by Derek Knight. The photos do not do it justice at all - it is a wonderfully detailed model. For example, the cowl fasteners poke through holes in the cowlings, there are little brackets and things all over the place, and even the rib tapes have been added everywhere. The silver finish was immaculate. 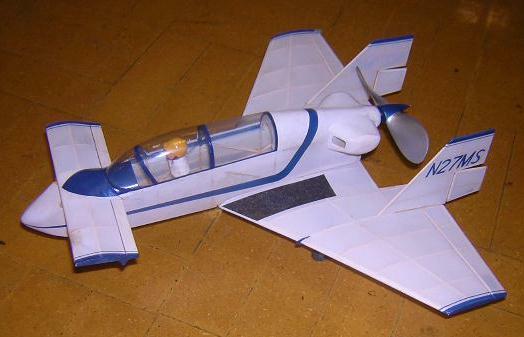 The model features a home made gearbox, so a small prop can be used, and it sounded just like an electric model in flight. Derek was trimming the model at the meeting, but still managed a 15 second qualifying flight from a hand launch. Later he managed a successful take-off and circuit, which was enough to show the potential of the model. I think Derek could win quite a few events with this model next year! 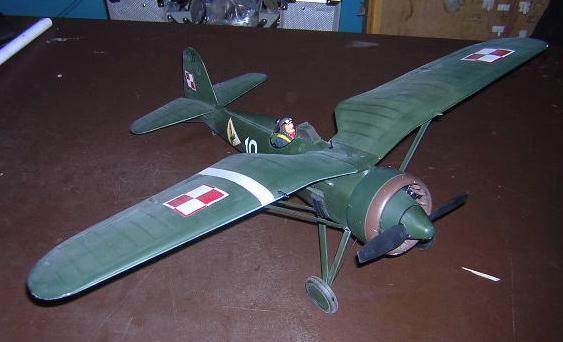 Another of Derek's outstanding models was this PZL P.11 for electric power. 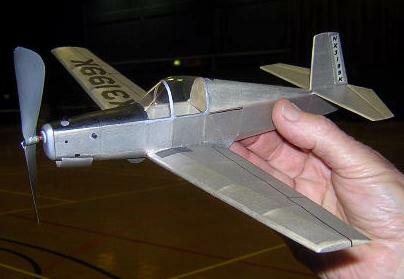 The fuselage is carved out of solid block, and hollowed out to get it as thin as possible. Excellent detailing in evidence again. 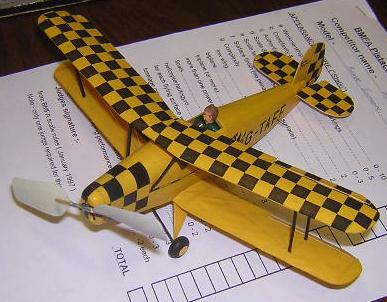 Unfortunately, it was refusing to cooperate when it came to flying, so Derek could not register a qualifying flight. 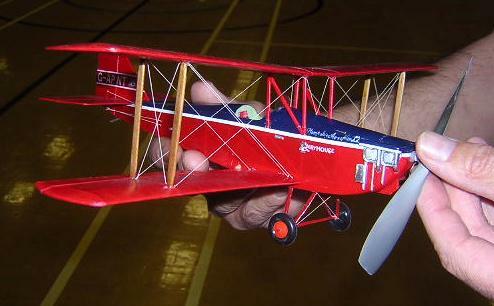 At the opposite end of the scale, here is Mike Hadland's latest Pistachio scale model - another Bucker Jungmann. Well, if you find a type that flies well, why not stick to a winning formula? The markings were very neatly done, and Mike's method may be of interest. 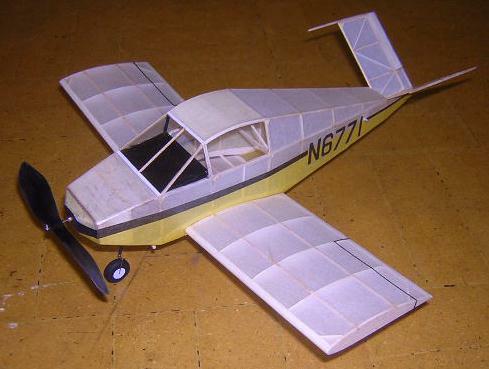 The model is covered with condenser paper. This was pre-shrunk on a frame, then passed through a printer to add the black markings. Then the paper was sprayed yellow from behind. 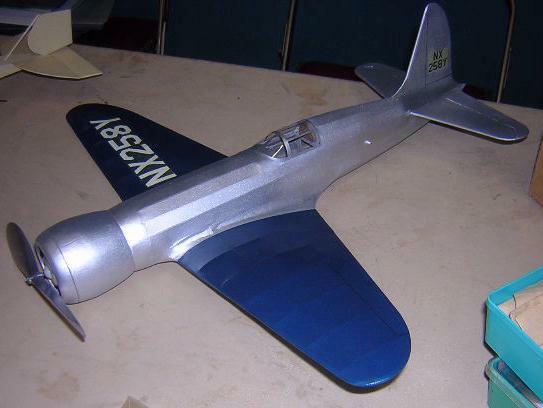 The only bit of the model not decorated like this was the nose cowling, which was painted. 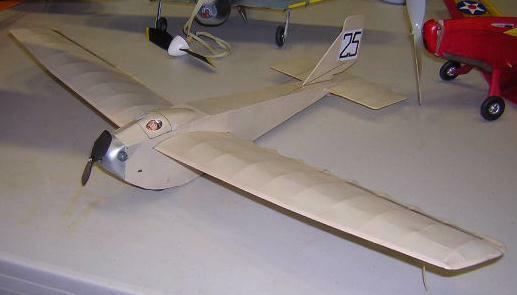 The wings are double-covered on this model, with the tailplane and elevators the only parts covered on one side only. Mike had some problems getting it to fly it during the timed sessions, but as is often the case, after the end of the competition it was cruising round in well behaved circuits! 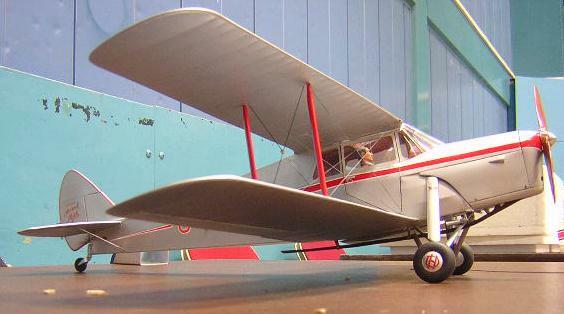 Chris Strachan brought along this new Peanut scale model - a Moony M18 "Mite", based on the plan by Walt Mooney. It flew very well, circulating just below the roof, with a best time of 47 seconds. 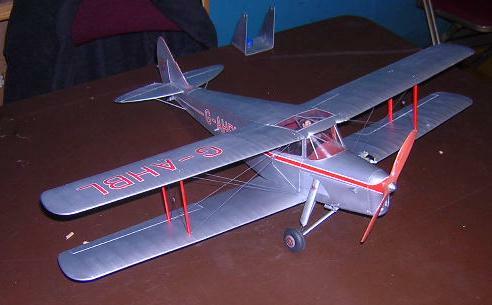 Another of Chris's new Peanut models was this Davis DA-2A, which was undergoing trimming flights. This nicely finished Currie Wot was entered in the Peanut class by Phil Morgan. I believe this model is based on the old Andrew Moorhouse kit, but modified to include scale rib spacing, and other added details. It has recently been rebuilt and repainted in this attractive scheme. 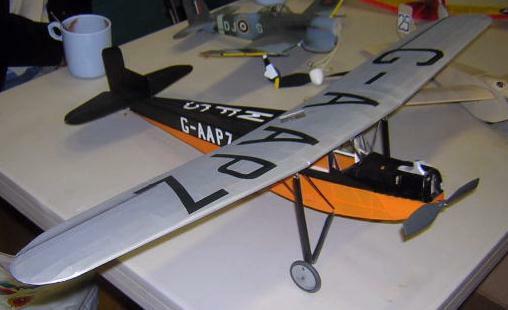 Peter Boys has built a bigger version of his delightful Peanut scale Waco VKS-7 to enter in the Open Rubber class. I saw the model at Interscale, but did not get a decent photo of it. Thus, I was happy to get the chance to make amends at this meeting. As usual from Peter, the detail and finish are first class. Peter is gradually working up to getting the model to take off, but did not quite manage it here. I am sure it will fly well, as the smaller version looks very stable in the air. Nigel Druce entered this Andreasson BA-4 in the CO2/electric class, powered by a Gasparin G43 motor. Nick Peppiat brough this Rutan Vari-Viggen peanut out of retirement to give it some flights. I had not seen it before, and was impressed with how stable it looked in the air. 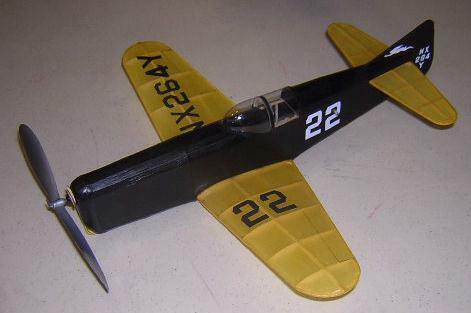 This neat peanut scale Marcoux-Bromberg Jackrabbit racer was the work of Laurence Marks, who was giving it some trimming flights during the meeting. 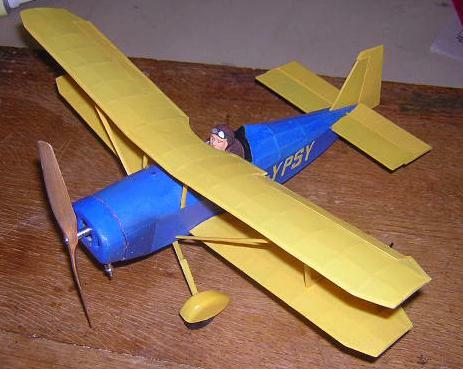 Lindsey Smith had a couple of new models with him - one this 1932 Handley Page Sayers monoplane. How on earth did the pilot see where he was going!